This dish tastes great out of the oven or perfect cold for the no hassle breakfast/brunch. Fry bacon and set aside to cool on paper towel to absorb excess grease. Dice onion and lightly sauté in olive oil. Set aside. Toast 1/2 tsp fennel seed in frying pan and finely grind in a mortar and pestel. Crack eggs and place in large bowl. Whisk in half and half. Add a pinch of salt pepper. Add fennel and thyme. Chop bacon and add to egg mixture. Add sautéed onion and stir. Spray a 9 inch round baking pan with olive oil spray and pour in egg mixture. 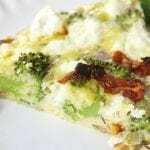 Evenly distribute broccoli florets, sun dried tomatoes across egg mixture. Crumble goat cheese and evenly distribute across egg mixture. Bake at 350 degrees for 18-20 mins or until egg mixture congeals. Cooking time may vary due to differences in ovens. Cool and garnish with avocado. Enjoy!